With the trend of ongoing events in Nigeria, it is now clear to all and sundry that any word uttered by our leader on Radio Biafra is the unquestionable truth backed up by irrefutable facts. Atiku's nationality debate attests to this. On Radio Biafra, every lecture on history, social policy, economy, politics and law is designed to liberate the poorly informed half-educated masses of Nigeria from the darkness and oppression of Fulani Caliphate misrule, illiteracy, broken education system, mediocrity and subjugation. Those who over the years derived joy in propagating the lies that Radio Biafra is about propaganda and hate speech are the ones today relying on it to get factual information on constitutional law in Nigeria. Senior Advocates of Nigeria now depend on Nnamdi Kanu to tutor them on constitutional law and the dysfunctional legal system of Nigeria. Those that referred to IPOB as miscreants are now the same people now quoting and referencing the speeches of our supreme leader Mazi Nnamdi Kanu in their legal depositions. Radio Biafra it has now been confirmed beyond every doubt is a citadel and arguably the best university in Africa as events surrounding Atiku's nationality attests. In the same vein and in due course, Nigerians will come to the inescapable realisation that Maj. Gen. Muhammadu Buhari is dead and the impostor in Aso Rock is neither of Nigerian citizenship as Atiku nor birth, which both Jubril and Atiku are not. The Fulani Aso Rock cabal and their friends in mainstream media in Nigeria can seek to dismiss this fact all they like but in the end the truth must surely prevail. Pretending that things are normal in Nigeria with the current level of injustice, poverty, pain, insecurity, hunger and oppression is a recipe for disaster. 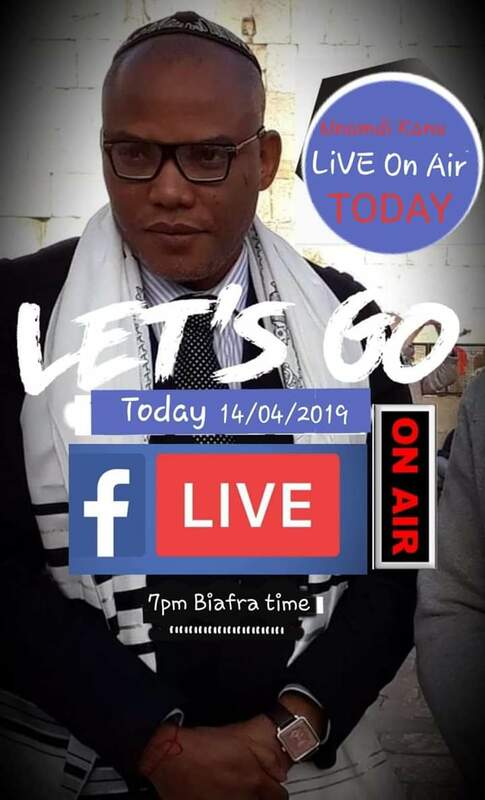 To drive home this message, our leader Mazi Nnamdi Kanu will deliver a special address on Radio Biafra tonight April 14, 2019 at 7 PM Biafra Time (7 PM UK) for yet another expose on the fraud called Nigeria and further clarification on the thorny issue of Atiku's nationality.